Kiss Me I’m Irish, Really! I’m a Quinn. Never really thought about that last name much, but I’ve done a bit of research for this post. I wanted to know more about my surname. My husband knows quite a bit about his father’s Scottish surname and history. He hails from the McLean Clan. I reasoned that I needed to know more about mine as well. We are competitive in that way. Plus, I have the added boon of an Irish holiday to spur the curiosity. Quinn Clan Coat of Arms. Pretty cool Pegasus. Irish Derivation is Ó Cuinn. It means the descendant of the Conn (or chief). Quinn is the Anglicized version, and can be spelled Quin,too. It hails from the legendary High King of Ireland, Conn of the Hundred Battles. Sounds pretty impressive, right? Conn is derived from ceann (or head) which signifies someone of intellectual ability. Pretty much sums me up, don’t ya think? I also found out that the Catholic descendants spell the Anglicized versions with 2 N’s and the Protestants with 1 N. Probably made those religious battle lines a tad easier to distinguish later in history. The most prominent Quinn clan hails from County Clare in Ireland. They date back to 1014 and Niall O’ Cuinn, who was the first to use this surname before dying that year at the battle of Clontarf. Quinn’s began immigrating to the British North America as early as 1685 with David Quinn landing in Philadelphia, Pennsylvania. Other means of migration occurred with soldiers hired as mercenaries in Europe, the resultant aftermath from the Protestant Reformation, the lure of freedoms and wealth in the New World, and smaller crop famines throughout Ireland’s history. The biggest influx of Quinn settlers was during the Great Potato Famine of Ireland in the 19th Century. I hail from the Quinn’s of Wisconsin. I’m really not sure how they got there either. My dad left there as a young adult and joined the Navy. He met my mother, who hails from a Baron that signed the Magna Carta, in Florida. Modern day Quinn’s move around and migrate, too. Our family ended up in Virginia thanks to the military. Good thing… cause I don’t really enjoy the cold. 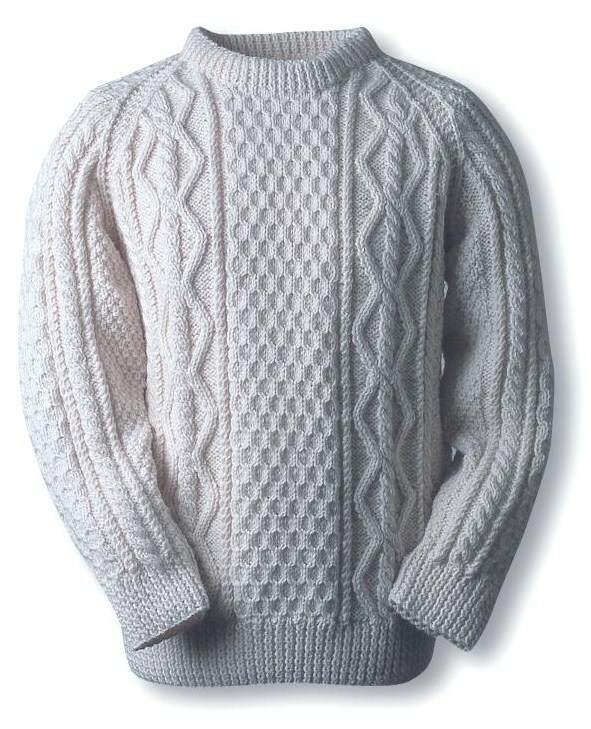 Although if I could afford or take the time to knit a Quinn Clan Aran sweater, I might feel a tad warmer. The Quinn Clan Aran Sweater. I had no idea that each clan had a different pattern for their Aran sweaters. It looks toasty doesn’t it. It also looks like it might take me 10 years to knit. So, I think this St. Patrick’s Day I won’t wear green. I will just tell everyone that I am Irish, that I hail from Niall O’Cuinn, and that my blood runs green. Oh, and I will gladly accept any and all kisses from “hot” guys instead of pinches. 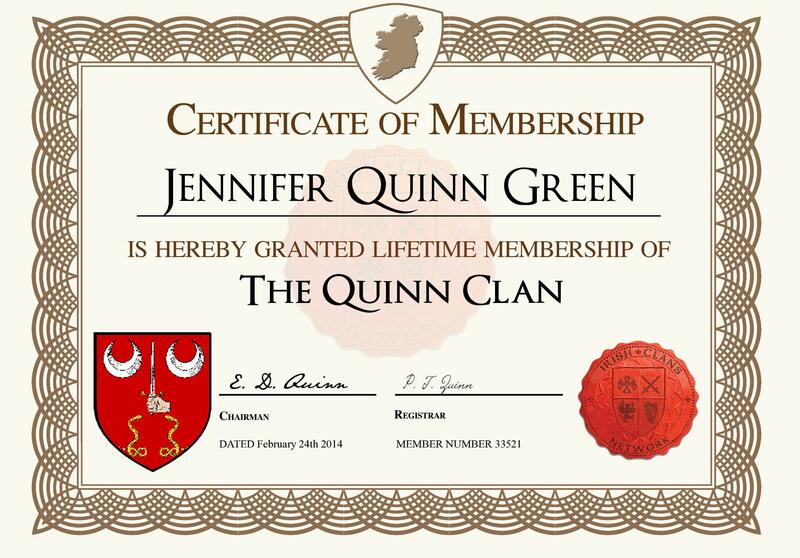 Oh, and just to prove I’m legit, I signed up at The Home of the Quinn Clan and received my certificate. This may have to go on the wall.